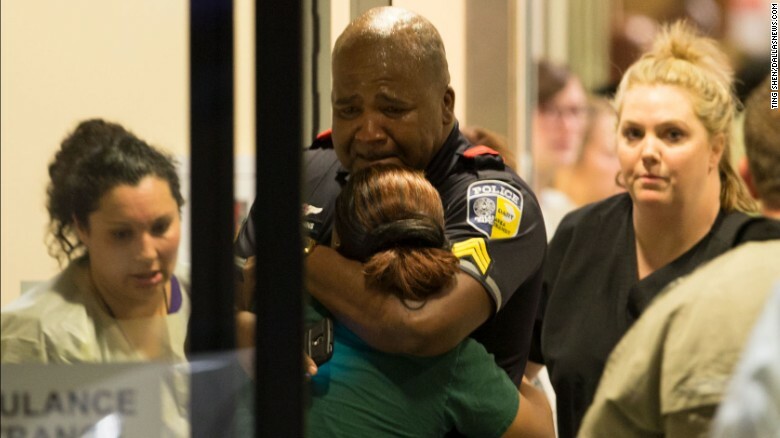 OUR COMMON HUMANITY: An African-American policeman and a White-American nurse grieve at a Dallas Hospital after the shooting deaths of five white policemen Friday, July 7, 2016. Sadly, the resurgence in racism started once Obama’s run for the Presidency was confirmed as the Democrats’ choice and by the time of his victory at the polls, perhaps African-Americans’ most laudable achievement since the abolition of slavery, the fire lit had become a raging inferno. With all due respect to the man, he has managed the very volatile ever-present racist situations very well, acting always as if the slights, the heavy disrespect and overtly-racist words and acts to his person and office did not represent “the people we are”, to borrow words he often used after repeated mass killings by gun-deranged individuals. Despicable and highly disrespectful as this may be to the office that Nixon held if not his person during the Watergate era, the Bill O’Reillys of Obama-era journalism in mainstream and non-mainstream including fringe media, have said and written worse. It’s often worrisome to see how the disrespect to the President is never understood by those self-important airheads that populate the media who claim to love America as being the equivalent of cutting the collective nose of all Americans to spite the same country they claim to love. If truth be told, President Obama has brought to the office he holds by the will of majority of the American people a lot of dignity and honor, and has worked very hard for a laudable place in history that awaits him, but you’d hardly know it. Suddenly, racists of all shades: KKKs, closet types, news media, politicians who proclaim ill-digested ideas and ideologies, and worse, “law-enforcement” officers who are paid and meant to protect citizens in all of America, started coming out of the wood works. Right after Obama’s historic victory, elected Republican members let it be known that they would not cooperate with the executive arm, and they did exactly that by ensuring that Obama’s nominations to appointive positions requiring confirmations, bills such as the Medicare Act – the so-called “obamacare” … suffered delay and/or outright rejections. 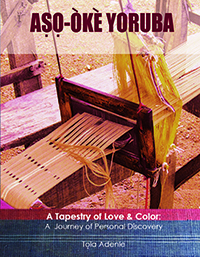 The tool of racism has always been violence to create fear in AfrAms, a fact that never went away with slavery. Resurgence of racism was fueled not just by increasing hardship of working class Whites as many are wont to believe but by politicians many of whom came into prominence as Obama was running for president and since the beginning of his presidency. Donald Trump readily comes to mind here as one whose candidacy and victory at the Republican primaries was built on racist utterances about Obama starting from the “birther” issue; he also thinks little of AfrAms as a group, a not surprising bend judging from his business practices in New York. Other minorities, including Hispanics, Jews, the physically-challenged, Muslims and perhaps those he hates the most, women. Remember [Tea Party] Sarah Palin’s “he [Obama] is not like us” during a doomed campaign for McCain who had chosen her as running mate to win the extremist right of the GOP? As day follows night, violence, encouraged from different sources was not far behind, aided by racists’ rants on Fox News and other news purveyors. Here are just a few that could have done nothing but embolden racial actions against AfrAms. FROM: http://bossip.com/1041085/13-racist-headlines-cartoons-and-ads-about-president-obama39204/5/ – where many more of bossip.com can be seen. The Ku Klux Klan, perhaps America’s first terrorist group, never really died but lay low for a while away from public eye for many years but has now returned claiming to be “the new KKK” but in the current fertile racist environment it’s already at its old evil ways burning crosses and causing violence. A firm foundation for fair and just relationship between AfrAms and law enforcement agencies could have been laid during the 1960s and 70s by working through AfrAm community-based groups like the Black Panthers but rather than a major government security agency, the FBI, employing dialog to channel the energy and resourcefulness of the young men who took on the responsibility to improve the lots of people within AfrAms communities which was mostly neglected, J. Edgar Hoover, the FBI Director, merely saw protesters as communists. After all, even till today long after the Panthers had seized being, Seale is still an active community organizer. The consequent show of vicious force visited upon the group only increased membership of then Black Panther Party despite the brutality and many police killings, and drove members more to extremism. Seale and others – mostly in their 20s, saw a system that abandoned blacks, a system they saw as being ready to spend on jailing them rather than on education, medical health, garbage disposal – all of which the group was doing and it endeared them to the communities in different cities. Of course back then, as now, it was a war Seale, Cleaver, Newton and their followers could never win just as Micah Johnson, the man who shotvand killed five police officers in Dallas while hiding in a tall building, must have known he could not survive his misadventure but desperation and hopelessness do not give room for rationality. AFTER MALIA OBAMA’S ADMISSION to Harvard and deferment of enrollment for a gap year, racists ranters on the web conveniently forgot who her parents are. Offspring of two parents with sterling academic achievements, you would hardly believe the vitriol poured on the girl. Obama not only attended Columbia – one of America’s top colleges, and later Harvard Law School where he was the first African-American elected as President of Harvard Law Review but Malia’s mother, the First Lady was a Princeton and Harvard Law school alumna. What do racist trolls spew about her admission, especially on foxnews, that megaphone of all things hateful to AfrAms? And Michelle Obama perhaps, has received the most racist pillorying from the nuts that have crawled out of the wood works since Barrack Obama got elected to a post millions of White Americans can still neither believe nor come to terms with. Her best intentions as in the quest to encourage parents to get children to eat right are denigrated. 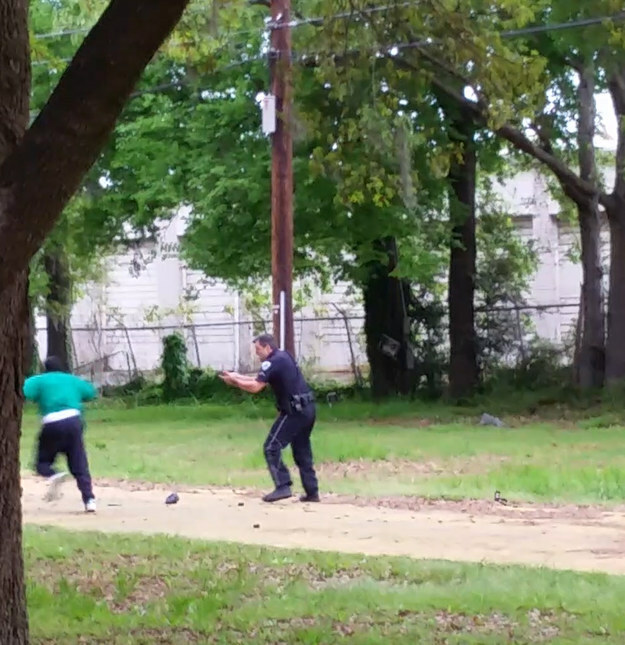 How do you describe two “law enforcement” agents pinning down a man who had been completely subdued and yet one of them brings out a gun and shot at close range the chest of an already subdued Alton Sterling? S-L-A-U-G-H-T-E-R-E-R! Twice within a week, two AfrAm males were shot at and murdered at close range, including Philando Castille who was driving with his girlfriend and a daughter in the back of a car that would become his slaughtering slab, where he would lay gasping for his last breaths as blood flowed freely from his wounds at the hands of a “law officer” who held firmly to a gun still pointed to the dying man. His offence? Another traffic stop that again went horribly wrong though – pardon me – went according to plan because the police officer apparently had to terminate an AfrAm male’s life that night. Three young white men murdered an AfrAm in Mississippi in 2011; they first beat him before RUNNING OVER HIS BODY WITH A TRUCK. The next stage in this horrible evolution that seems to aim for a return full circle to slavery days but which AfrAms are saying ‘never again’ to, took a surreal turn Friday when five policemen were hunted down and killed in revenge at Dallas by a former army man who, though dressed in body armor, surely must have known his final day was at hand. Is there a more dangerous person than someone, a group or a community of humans for whom hope is completely lost? Is a desperate person ever rational? And two ‘firsts’ happened in the progression of race relations that I am afraid usher in new uncharted territories on Friday, July 8, 2016 that would resound beyond Dallas, Texas, USA. Micah Xavier Johnson showed the extent to which a desperate person was willing to go rather than continue to live a life he must have convinced himself was no longer worth living by engaging in what was not less than a suicide mission. The second genie out of the bottle was the use of a remote-controlled robot that tore that person who believed he was fighting an inhumane and unjust system, to pieces. Whatever way we choose to describe the Dallas event, the action and reaction ended half a dozen lives and left many wounded, and despite all the killings, protests are still on in major cities over the issue of inequality in justice and opportunities, especially the injustice that now almost always end in killings of young AfrAm males. A couple of days later as earlier mentioned, another AfrAm male is shot dead in his car but this time, the man’s girlfriend and daughter were in the car and the young woman had the police action streamed live to the whole world. Meanwhile on tv and everywhere, there are thoughtless and shallow overpaid news people talking shop, including asking stupid questions from numb AfrAm family members like the one CNN’s Cuomo, if I can recall, asked Castille’s mother about her opinion of the Dallas shooting! Such insensitivity! The poor woman told him she had not been watching tv and had nothing to say. A sick racist, you are, Rudy Giuliani! 50-year old Walter Scott, tried to run from a policeman from a traffic stop for a broken taillight in South Carolina.The man in blue could have stopped him with a shot to the leg if he must shoot but it never goes that way in the hunt for black males. This is close to home. Savannah, GA: Ajibade’s girlfriend called 911 – the US emergency number for police, fire department … – to ask police to take him to the hospital because he was having a manic episode (he had bipolar disorder). Instead, they arrested him and took him to the Chatham County Detention Center. The Sheriff’s Office claims that he fought officers, so they put him in a restraining chair. He died in the restraining chair. Deputy Kenny was convicted of cruelty to an inmate and Deputy Evans was convicted of public records fraud and three counts of perjury for killing Matthew. Deputy Kenny was sentenced to 1 year in jail – to be served only on weekends – and 3 years probation while Deputy Evans was sentenced to 6 years probation. Finally, the present tragic situation may be difficult for whites to come to terms with but what led a young man to the extreme action in Dallas is not likely going to be the last of such, nor the last for police using the new-found toys employed to remotely destroy things and now humans. It may one day tear into shreds entire members of a household where a wanted man would be holed up. Some jobless, hopeless young AfrAm males may find solace within the ranks of many of the evil extremist groups that pervade the world today; it will neither solve their problems but would definitely be fatal to many of us. The American system must be reworked to create equality of opportunities and justice before the law as the beginning of an end to hostility between AfrAm comunities and policemen. The British Home Office did the same after the massacre at the LGBT club in Orlando recently. Countries big and small issuing travel advisories to their citizens as the United States of America’s State Department always does as regards volatile areas of the world for her citizens should not become a state that the extremists of society – the Trumps, the KKKs, the Tea Party-ers and other nuts of the ultra-right wing of the Republican Party – will on bring on the country. The Sierra Club’s executive director Michael Brune made a statement today in support of ending the needless violence against black citizens. “It is impossible to not be outraged by the devastating images of black people being gunned down by police on a shockingly regular basis and it should be impossible to remain silent in the face of this sustained injustice any longer. Sadly, the tragedies that are unfolding before our eyes are just a fraction of the violence that has been happening off camera in our nation for far too long. Judge Carlton Reeves's speech to three white killers of black man dragged to his death by truck, Micah Johnson shot inside his car at close range by policeman in Minnesota, Murders of African-American males in the hands of police escalate, Nigerian-American Matthew Ajibade's death in custody of policemen, Sierra Club's Michael Brune calls for an end to "the needless violence against black citizens"
An overview of what is happening in the world especially in America (the killings in Baton Rouge and Minnesota as well as Dallas) leads me to reach a conclusion about the promise of the Almighty that He will not wipe us off the face of the earth with another ‘Deluge’, a promise He has kept so far, but WE will wipe ourselves out as a result of HATE. If you do on to others as you want others to do on to you, you will not take a life that you cannot create. Can any of us even create the little ant? I understand that HATE is borne out of ignorance (stupidity) and this is one of the two things, ( the other is greed) that can also destroy the world as we know it. We must all keep in mind the words in the song – “Let there be peace on earth, and let it begin with me. Thank you, Mr. Ajipeya. And the words of Rodney King who was beaten almost to a pulp Before Social Media (BSM) by Los Angeles Police in the early 1990s and massive rioting broke out: “…can we just get along …? The words of the young son of Stirling about people turning away from hate, as well as the violence that has engulfed America since his father and Castille in Minnesota were killed are also noteworthy.